hidromiel, Hisp Ar alacha, lacha, ladj, Cat alatxa, L. agua mulsa, alosa or luccia, Rome and Corsica alacha, lacha, Naples alatxa, Ar. aloxa Fr. mulsa, Eng. 1. mead, hydromel, a non-alcoholic drink formerly called a pellitory infusion, honey and water syrup a non-alcoholic infusion made with a mixture of honey and water. The 13th C Anon al-Andalus calls for one oz of honey and 5 lbs water boiled until all the water has evaporated. The honey is skimmed constantly. Then 1/2 oz. of pellitory root is added. The mixture is strained through a cloth and put in a marmite (over low heat) where the root is bruised until pirathrine oil and insulin substance is released from the oil glands. Then it is poured into a glass jar and drunk as needed. It could be drunk as a cordial or used to relieve toothaches or headaches. It was popular from the beginning of beekeeping and especially in the Muslim world for its non-alcoholic content. See aloja. 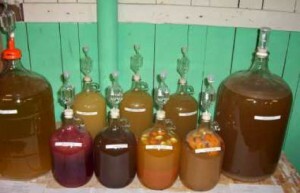 2. mead, an alcoholic drink consisting of three - five parts water boiled with one part honey. When cool yeast is added. This is stored in a warm place for two to four months to ferment before drinking. 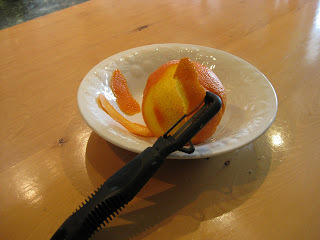 Remove orange peel of orange with a vegetable peeler leaving the white. Slice the peel into nicely cut slivers. Cut the orange in half and squeeze out the juice through a strainer into a 12” frying pan. Add the orange rind. Peel the pears and quarter them lengthwise. Remove the core and immediately add to the orange juice, spooning the juice over them so they do not turn brown. Add mead and honey. Stir the mix and simmer for 30 minutes or until the pears are tender. To serve: If it is winter, serve warm right out of the pan with strips of orange peel, a few flakes of the cinnamon stick and/or sprigs of mint leaves. 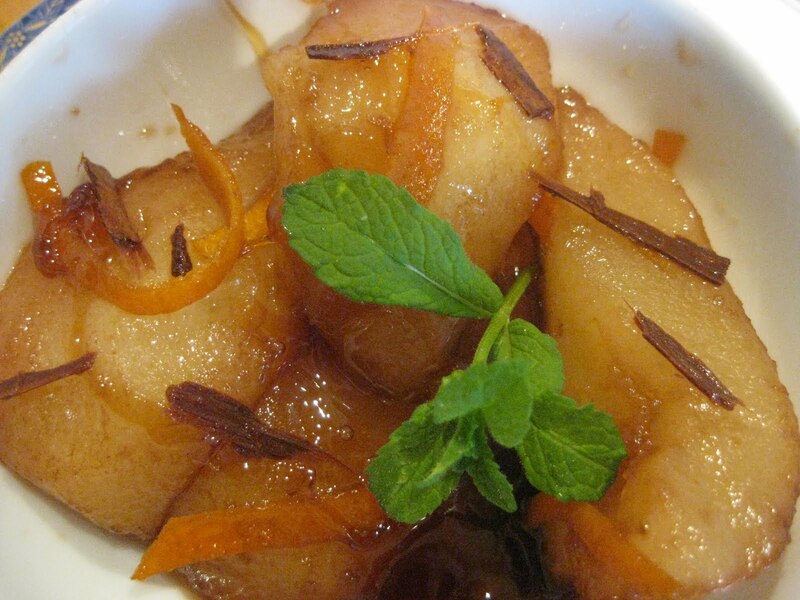 If it is summer, let the pears cool in the poaching liquid at room temperature, then refrigerate. Serve with orange peel, whipped cream, flakes from the cinnamon stick and/or sprigs of mint leaves. Do not serve with chocolate as this is an American product. *If mead is unavailable a port wine can be used as a substitute but it would be a pity as the purpose of this recipe is to try mead, the drink of the gods, heroes, kings and lovers! If port or other sweet wine is used add 1/3 c honey instead of 2 tbsp.